Profi comes complete with a rugged 0.63mm thick razor-sharp blade # 5232, which is ground with extra broad facets to reduce the cutting load. (Extra blades available at £29.50/100, code 5232.70). To change the blade you push the spring loaded blade assembly out of the cast metal body and drop in a new blade from the dispenser. Each blade can be indexed twice before you need fit a new one. Here's a shot of Profi (right handed version) in action. The two shots are during and after a cut. 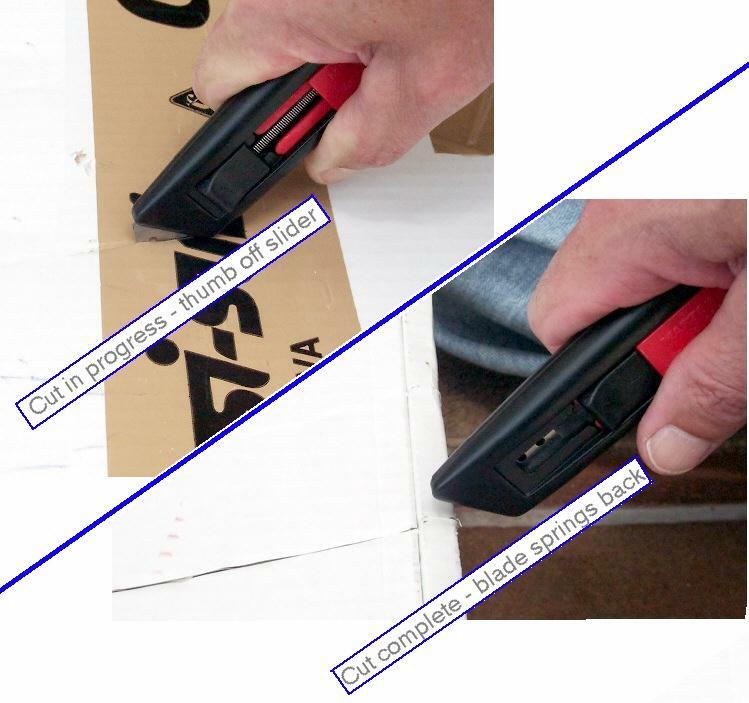 Note where your thumb should be for correct safe cutting. You can also fit hooked blades (code 56.70, cost £56.80/100), or in another version of the same knife (type 07105.02) you can have the blade projection limited to 5mm. For extra durability, try the Titanium Nitride coated blades (code 852.42) available at £8.30 for a pack of 5 pcs. All prices mentioned are ex-works, exc VAT and are correct at Dec 2007.